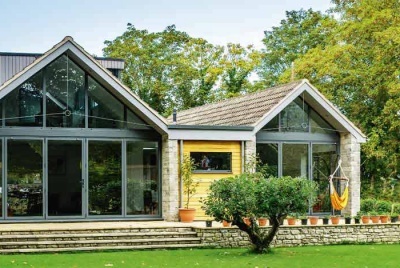 As a developer, Stuart Ward was well-placed for knowing how to create amazing homes when he came across a 1950s bungalow on a large plot in east Dorset. “There are lots of bungalows on huge plots in this area and there’s a lot of SSSIs (Sites of Special Scientific Interest), so not many of these large plots are allowed to be subdivided,” explains Stuart. 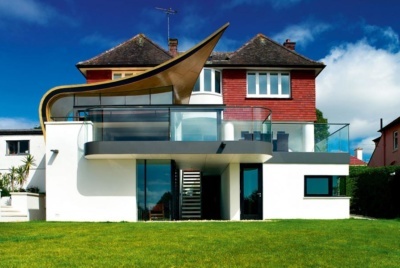 Stuart approached architectural designer Tony Holt to help visualise his plans and turn them into a reality. 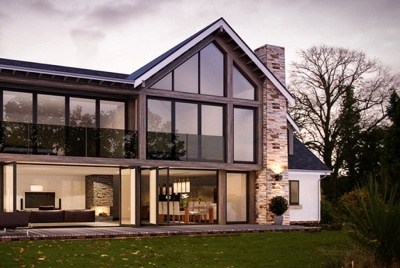 “I had an idea of what I wanted and knew I was after something modern with twin gables. 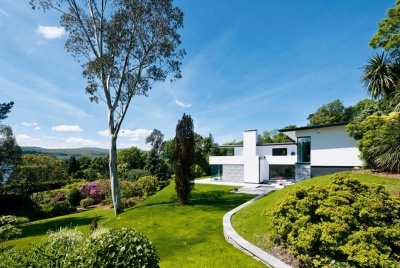 I also knew that in order for the project to be comfortable with the planners the house had to have a traditional element to its design as there were no contemporary houses on the road,” explains Stuart. Part of Stuart’s brief was to try and keep the spaces as versatile as possible — for instance what is now the snug and open plan dining area could easily be swapped around. It also included a home gym. When the couple viewed the bungalow, they could see there was a substantial five-bed house next-door, which gave them an idea of what would be appropriate for the area. Stuart took on the role of project manager and builder, and together with a local labourer, he began semi-demolishing the old bungalow to make way for the rear extension, along with removing the internal walls to open up the ground floor. Towards the end of digging the footings for the new extension they suffered from heavy rainfall which caused the water table to rise — the works ground to a halt for four months. Once work was back underway, the build itself went quickly thanks to constructing the walls of the new extension in a single-skin of 240mm-thick aircrete blocks bonded together with adhesive. “This thin-joint construction technique is a brilliant way to build quickly and we imported the materials from Europe,” says Stuart. The bungalow was extended to the rear by approximately 3m and steel thrown up across the open plan space to open that section of the ground floor up, making the link between old and new seamless. The property has been opened up to the rear to feature a large open plan kitchen/dining/living space which now works well for entertaining and large family gatherings. Upon entry, the double-height hallway with galleried landing and staircase (built by Stuart) is also partially open plan to the rear, with a curved glass wall zoning the entrance space while allowing guests to flow through into the kitchen/diner and providing views out to the rear garden from the front door. Open plan accommodation has also been introduced in the new master suite. A bathroom has been incorporated — cleverly zoned thanks to the central double-sided fireplace which has been clad in the same slate-effect cast concrete tile as the exterior and ground floor feature fireplace. In order to bring light into the home, heavy doses of glazing have been added to the front and rear, with glazed gables to the new first floor, along with full-height windows to the front and expansive sliding doors to the back — all triple glazed and slightly tinted for privacy. 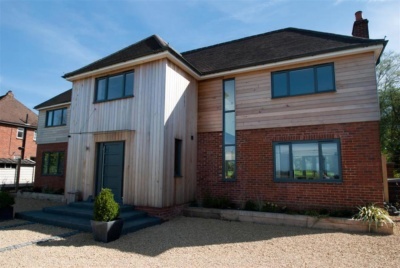 The way that the house is orientated on the plot means that there is now plenty of light entering from the rear elevation in the mornings and the house is lit from the front in the evenings. hey, i love this house. currently re-moddeling my bungalow. i love the slate effect cast concrete tiles. please can you tell me where you got them from ? i have searched high and low.